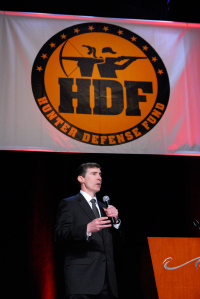 The Hunter Defense Fund, the first Super Political Action Committee created to the sole defense of our hunting heritage, received over $170,000 in donations on Saturday February 8, 2014. The Hunter Defense Fund has two primary goals. Making our issues of hunting and conservation an issue in federal elections and making sure pro-hunting candidates win in their fights against anti-hunters. Through the amazing donations of attendees during the 2014 SCI Hunters’ Convention we can make these fights real.